As I was preparing to speak at a prayer leadership meeting the other day, I felt impressed by the Holy Spirit to share some thoughts from John 16:33. This verse of Scripture has gotten my full attention at the beginning of 2009. There are several things that God has spoken to me through John 16:33 that I believe are pertinent to the year ahead. The first thing is we can be certain that we will face tribulation. This is nothing new. The church of Jesus Christ has been living through tribulation since its birth two-thousand years ago. The second thing is that Jesus does not want us to place our focus on tribulation, but on Him. Jesus has overcome the world, but if we put our focus on tribulation, the world can easily overcome us with worry, fear and anxiety. The third and fourth things are huge anchor points for us. Jesus tells us that even though we will have tribulation we can have His perfect peace; He also tells us that we are to be of good cheer. These two things, perfect peace and good cheer, should dominate our thinking, our speech, and our attitudes in the coming year. Nothing in this world has the power to take from you what Jesus wants to give you. It is Jesus who has conquered darkness and overcome the world. It is Jesus who is on the throne. It is Jesus who is working out His plan for your life and mine. Take Jesus’ peace, He is not worried; take His joy, He is not discouraged; take His rest, He is not uptight; take His victory, He is not defeated; take His life, He is not dead. He alone has all the power, all the peace, and all the good cheer you will ever need. 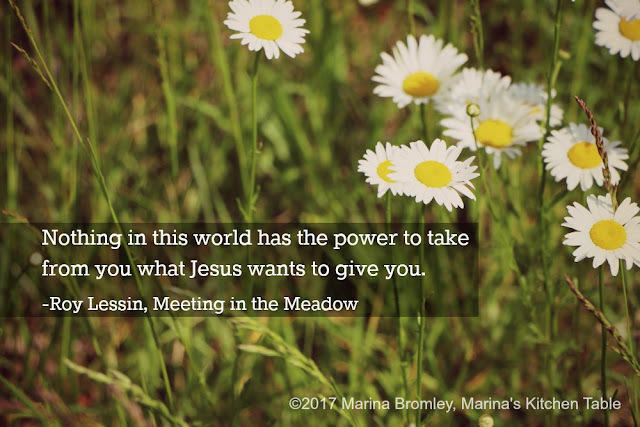 ©2009, 2017, Roy Lessin, Meeting in the Meadow, and Marina Bromley, Marina's Kitchen Table. This post first appeared in 2009. Used with permission.